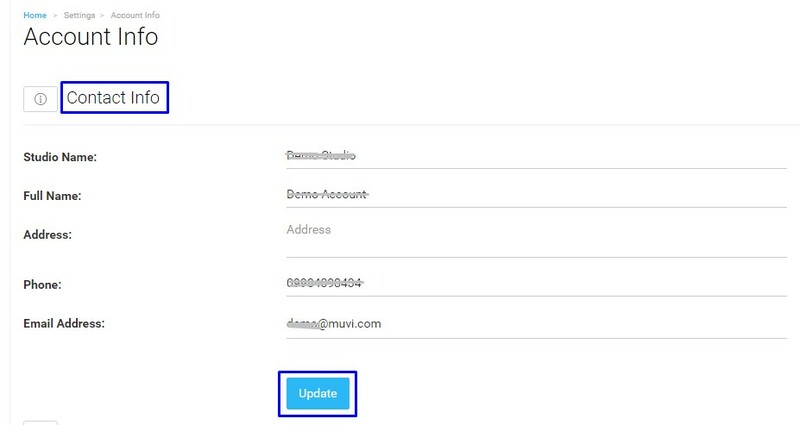 Through Account Info, you can update your contact information, change your Muvi password or cancel your subscription. To update your contact information, go to “Settings” --> “Account Info” in your CMS. Your contact details will be updated. To change your password, go to “Settings” --> “Account Info” in your CMS. Under “Security’, first type your old password, then type your new password and re-type your new password in the corresponding field. You can cancel your subscription at any time you want. To know, how to cancel your account please Click Here .